What gets tiresome about baseball, any sport really, is the incessant conversation about money. Who owes it, who gets it, who hoards it, who deserves it, who wastes it, who steals it. So, if you weren’t careful, you’d miss the game. Those who play it. How they play it. Their stories. What makes them go. What hurts them and inspires them and scares them and punctures their souls and takes their breaths away. You’d miss, for one, the young man who’d kept his head down, the young man of clear eyes and heart, who’d shown up saying he plays for the fun of it, for the winning of it. The spirit of it. And then convincing us it was real, by revealing it in his deeds and his habits. The young man who’d, granted, become the best-paid player in the game (and remained underpaid), but only as a consequence of how he’d chased the game. He’d not hunted anything as inconsequential as one more dime, one more TV spot, one more brand bump, one more ounce of fame. He’d played ball, shrugged and smiled at the 21 hours around the game, then played ball again. It was simple and dignified. It was honest. It asked for nothing but a decent shake and received in return precisely what it deserved: respect. That, and lots and lots of money. Mike Trout has agreed to a 10-year, $360 million extension with the Los Angeles Angels, first reported by ESPN and confirmed by Yahoo Sports. That will follow what he was already under contract for, the $68 million and change due to him over the next two seasons. The agreement comes with full no-trade protection. There are no opt-outs. 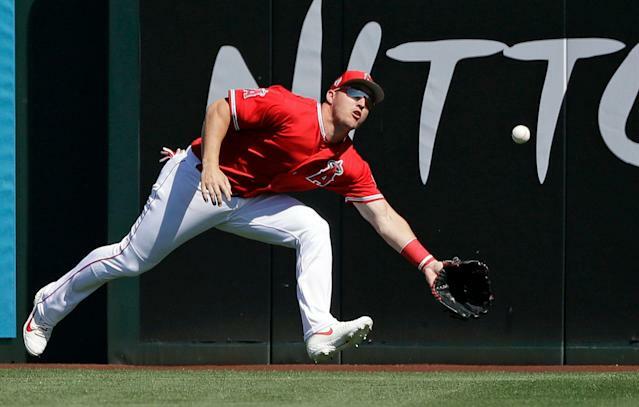 There is only a promise of Mike Trout end-to-end as an Angel, from draft day 2009, when he was 17 years old, to 2030, when he will turn 39 and pose for the statue. Well, good for the Angels and their owner, Arte Moreno. Good for the people of Orange County and beyond, who fell for the kid when he arrived to bat eighth or ninth and bounce between left and right fields, because he stood for a better tomorrow and a forever of soaring tomorrows, because he was the one who soon enough would live up to the advance hype. That the Angels have not lived up to him continues to haunt the old ballpark and the men with offices there, but good on them for starting again — again — with the best player they’ve ever seen. And they need to get to work again — again — on living up to him. He’d had options. His buddy, Bryce Harper, wasn’t in a Philadelphia Phillies uniform for a day when he’d recruited Trout to the ballpark set not an hour from Trout’s hometown. Free agency was two seasons away. He was a homegrown Phillie. The New York Yankees swear they would’ve taken Trout at No. 29 the June day the Angels took him at No. 25, and 12 years later would’ve not been bound by anything as quaint as draft order. The Los Angeles Dodgers may have more money than the Yankees. A dozen teams would clear the free coffee from their break rooms if it meant saving cash for Mike Trout’s free agency. He’d almost certainly yearned for the sort of October at-bats that would come in another organization, one that expected October baseball, one that settled for nothing less. As it is, of the seven full seasons Trout has played, one of those has led to the postseason. That incomplete team was swept in the first round. And, yet, he’d never cared for what more baseball could give him. What it owed him. What more he could grab. He married his high school sweetheart. He goes home in the winter to hunt and fish, like he’d spent all his winters before. He spends another few months being Mikey, hanging out in the old gymnasium, the old diner. He returns every spring a little older, perhaps a little more secure, and with the same, hey-how-ya-doin’s, the same humble intentions to be not necessarily the best player in the game, but the best player today. Put enough of those together and the rest follows, including the paycheck that is supposed to prove it. When scouts and fans and writers and managers talk about playing hard, running hard, caring more, selling out to the game, they are talking about him. When they say it’s impossible to serve every game, to treat them all as one’s last, to scrap for every inch every damn night, they are forgetting about him. When the Angels announce the contract, assuming the agreement becomes official, he’s likely to be the most uncomfortable man in the room. Not because he hadn’t earned it. But because he’s not lingered long on who owes it, who gets it, who hoards it, who deserves it, who wastes it, who steals it. He’s just the guy who plays the game, and it still takes his breath away.